Important note: I really enjoyed this book, but I am neither trans nor queer so please also consider reading Claire’s review (which raises some very important points from a queer perspective) and Holly’s review. A Quick & Easy Guide to Queer & Trans Identities is an absolute gem of a graphic novel. It’s quirky, punchy, unique, and straightforward – wrapped up in gorgeous illustrations and interspersed with heartwarming snippets of true stories. Although the purpose of A Quick & Easy Guide is to unpack some of the more popular labels used in LGBTQ+ discourse, it goes beyond a simple outline of gender identities and sexual orientations. Rather, it delves into the intricacies of human relationships and by doing so undercuts the narrow perception of what constitutes “normal” in our society. 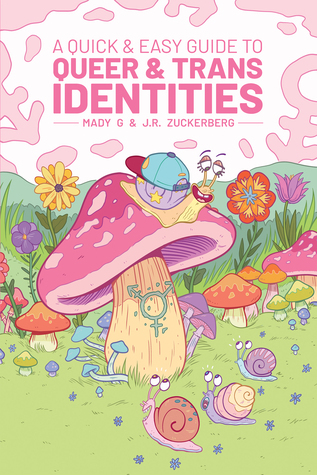 Mady G and JR Zuckerberg manage to educate their readers without oversimplifying the complex and often traumatic experiences of queer identity, to debunk arguments that these issues are “too difficult to understand” through accessible explanations. That being said, A Quick & Easy Guide is not simply targeted at soon-to-be-allies of the trans community – it’s targeted at those of us who already think of ourselves as allies, too. It can be all too easy to learn a few definitions and think of ourselves as “woke”, but the reality – which this novel was brilliant at exposing – is that inclusivity goes far beyond that. In this regard, A Quick & Easy Guide can be quite a challenging read, but this is what makes it so important. Being a cishet woman, I can’t attest to whether this novel was extensive in its discussion, but I can say that I found it extremely helpful in gaining a more solid understanding of terms and concepts that I thought I was already familiar with. I think A Quick & Easy Guide is a brilliant starting point for anyone unfamiliar or uncomfortable with LGBTQ+ identities and labels, and an essential read for anyone whose identity has never been restricted by rigid binary classification schemes. A Quick & Easy Guide to Queer & Trans Identities is due for publication on 23 April 2019. Thank you to Oni Press via NetGalley for providing me with a free copy of this graphic novel in exchange for an honest review.